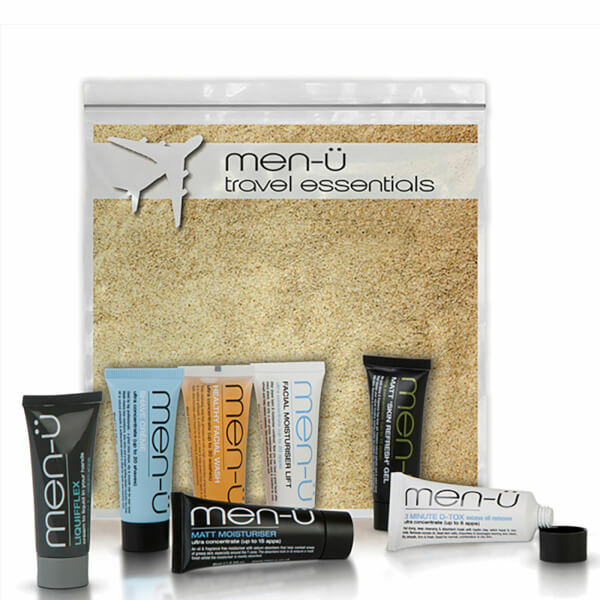 Discover a comprehensive holiday kit with Men-Ü Travel Essentials, a gift set containing seven travel-sized skin and haircare products to cleanse, moisturise and achieve a smooth and comfortable shave. Achieve a smoother shave with the Shave Cream. Its unique formula contains Tea Tree Oil which works as an antiseptic to soothe and protect skin from spots and shaving rashes. Enriched with moisturising ingredients, the cream can be used with or without a shaving brush and allows a closer shave with less resistance, less irritation, fewer nicks and a longer lasting blade. A cleanser ideal for using pre and post shave. Its unique, soap-free formula deeply cleanses skin and contains powerful ingredients, including antiseptic Tea Tree Oil to protect from breakouts and shaving rashes. Soothing Witch Hazel helps heals skin and control grease, especially around the T-zone, whilst Aloe Vera and Vitamin B5 moisturise skin to leave it hydrated and healthy-looking. Removes impurities and controls excess oils and shine. The refreshing formula contains Willow Bark Extract which works as an antiseptic to soothe and calm skin, especially after shaving. The fragrance-free gel is enriched with Salicylic Acid and Witch Hazel to exfoliate skin and unblock clogged pores, revealing healthy-looking skin. A two-in-one aftershave balm and moisturiser that helps to relieve the appearance of redness. The non-greasy treatment soothes and smoothens skin, leaving it with a cooling Mint and Menthol fragrance. Suitable for use on the face after a bath or shower, or as a face wash when you need a refreshing boost. A practical answer to daily shine. Endorsed by professionals, the formula is oil and fragrance free, meaning less risk of irritation. Sebum absorbers help combat areas of greasy skin, especially around the T-Zone. The absorbers kick in for a matt finish whilst the moisturiser is readily absorbed. It also contains Vitamin E which helps tackle the free radicals that age the skin. An intensive face mask that uses a potent blend of Kaolin Clay, Witch Hazel and Zinc to draw out impurities and excess oil from deep within pores, leaving the complexion fresh, clarified and bright. Suitable for combination and oily skin types. Achieve long lasting style with a flexible hold with a unique styling product designed especially for men. Delivering extra body and volume without leaving behind a sticky residue on the hair for a salon fresh look every time. Suitable for all hair types and styles, it liquefies easily for effortless application. Shave Crème: Apply a large pea size amount on to the side of a damp shaving brush or 1.5 to 2 shots into a wet palm. Spread with circular motion generating a creamy, rich lather. Rinse face well after shaving. Facial Wash: Apply a small pea size amount into your wet palm. Rub both palms together to generate a low level of lather. Gently massage over your damp face. Avoid contact with eyes. Rinse & pat dry with a towel. Refresh Gel: After shaving and / or washing - rinse and pat dry with clean towel. Apply thumb nail size amount over the face & neck, massaging in gently. Use more if required. Allow 30-60 seconds to dry. Moisturiser Lift: Ideal for use after shaving & / or washing - rinse & pat dry with clean towel. Spread a large pea size amount between palms and apply to face and neck area. Moisturiser: After shaving and / or washing - rinse and pat dry with clean towel. Apply thumb nail size amount over the face & neck, massaging in gently. Use more if required. Allow up to a minute for total absorption. D-TOX: Wash & rinse face & neck. Dry skin with clean towel. Apply an even layer of D-TOX, avoiding the eyes. Allow the product to dry for 3-5 minutes. Rinse thoroughly with clean, warm water & pat dry. Great for the T-zone (forehead & nose). Liquifflex: Spread a small amount (approx. 2mls) between hands, liquefy & spread evenly through dry or towel dried hair. Style as required. Use extra for more structure & definition. Replace cap after use. Shave Crème: Aqua, Palmitic Acid, Myristic Acid, PEG-8, Glycerin, Stearic Acid, Coconut Acid, Potassium Hydroxide, Triethanolamine, Sodium Lauryl Sulfate, Parfum, Phenoxyethanol, Propylene Glycol, Mentha Piperita Oil, PEG-14M, Hydroxyethylcellulose, Caprylyl Glycol, PEG-12 Dimethicone, Chlorphenesin, Melaleuca Alternifolia (Tea Tree) Leaf Oil, Limonene, Linalool, Menthol, Lauric Acid, Butylphenyl Methylpropional, Sodium Sulfate, Hexyl Cinnamal. Refresh Gel: Aqua (Water), Alcohol Denat, Hamamelis Virginiana Extract, Glycerin, Salix Nigra (Willow) Bark Extract, Amorphophallus Konjac Root Powder, Polysorbate 20, Aloe Barbadensis Leaf Juice, Phenoxyethanol, Triethanolamine, Carbomer, Benzoic Acid, Dehydroacetic Acid, Triethylene Glycol, Panthenol, Ethylhexylglycerin. Moisturiser Lift: Aqua, Paraffinum Liquidum, Cetyl Alcohol, Glyceryl Stearate, Palmitic Acid, Glycerin, Stearic Acid, PEG-30 Stearate, Dimethicone, Phenoxyethanol, Menthyl Lactate, Ethylhexyl Palmitate, Parfum, Caprylyl Glycol, Tocopheryl Acetate, Chlorphenesin, Menthol, Xanthan Gum, Aloe Barbadensis Leaf Juice, Sodium Lactate, Citric Acid, Limonene, Linalool, Butylphenyl Methylpropional, Hexyl Cinnamal, Sodium Hydroxide, Alpha-Isomethyl Ionone, Citronellol, Potassium Sorbate, Sodium Benzoate. Moisturiser: Aqua, Aluminum Starch Octenylsuccinate, Ethylhexyl Palmitate, Ethylhexyl Stearate, Glyceryl Stearate SE, Propylene Glycol, Dimethicone, Glycerin, Cyclopentasiloxane, Cetearyl Alcohol, Sorbitan Oleate, Polysorbate 20, Phenoxyethanol, Tocopherol Acetate, Lactic Acid, Dimethiconol, Ceteareth-20, Xanthan Gum, Carbomer, Allantoin, Sodium Hydroxide. D-TOX: Aqua (Water), Kaolin, Paraffinum Liquidum, Glycerin, Lanolin Alcohol, Oleyl Alcohol, Zinc Oxide, Magnesium Aluminium Silicate, Cera Alba (Beeswax), Cetearyl Alcohol, Polysorbate 20, Sodium Acrylates Copolymer, PPG-1 Trideceth-6, Sorbitan Palmitate, Xanthan Gum, Parfum (Fragrance), Hamamelis Virginia (Witch Hazel) Extract, Benzyl Alcohol, Triethylene Glycol, Propylene Glycol, Sorbic Acid, Phenoxyethanol, Linalool, CI77891 (Titanium Dioxide), CI77288. Liquifflex: Aqua (Water), Alcohol Denat., Sorbitan Palmitate, Dimethicone, VP/VA Copolymer, Propylene Glycol, Trimethylsilylamodimethicone, Carbomer, Lanolin Alcohol, Petrolatum, Panthenol, Cetearyl Alcohol, PEG-20 Stearate, Parfum, Sodium Hydroxide, Phenoxyethanol, Caprylyl Glycol, Sorbic Acid, Alpha-Isomethyl Ionone, Butylphenyl Methylpropional, Citral, Coumarin, Hexyl Cinnamal, Limonene, Linalool.